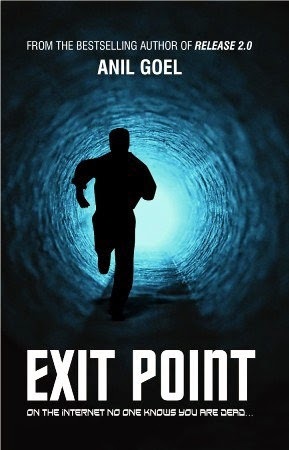 Exit Point, written by Anil Goel is an IT thriller book that revolves around the dark mysterious online world. This is the writer's second book and his first book - Release 2.0 was of the same genre. This thriller writer knows how to put things together and especially when everyone knows that writing thriller is the most difficult thing to do , he makes it look so easy. The story revolves around multiple cities across the globe across different timelines. It introduces us to different characters who mark an imprint on your mind. One such character is Alok, a techie from India who rules the plot! It takes us to the mysterious dark online world where the writer has tried his best to make us ponder on the online identity of people. The byline of the book reads - on the internet no one knows you are dead! Indeed true it is! It contains too many characters but one thing you should know that major portion of the book covers the mystery revolving around the death of Megan Baxter , an intelligent teenage girl from Australia. The case investigating officer seeks help of Alok, a techie from India, who plays an important role in unleashing several clues and gets them close! Several events such as dead sharks along the coast of Bondi beach, Megan Baxter's death, Rashid Chacha's murder by Mr Baxter ( Megan's father) and many more twists across the tale only makes the story intriguing. Anil Goel definitely has the knack of keeping his readers glued. But somehow at some places I felt that the plot was being dragged unnecessarily. There are too many characters and all the characters have done their bit perfectly. However this book being vast, one requires lots of patience and time but its worth it. It plunges deep into the online world and Alok's character is brilliantly potrayed. It took me several sittings to complete this book - curse my busy timeline and last minute vacation plans. This story has got too many elements that will enlighten the reader in you. What links all the events in this book and how the tech genius Alok helps in resolving the mystery is something that should be looked for! People who know technology and internet very well can get something out of it as they can relate to the different things mentioned in this book by one of the main character. This is a very good thriller book and I recommend this book to all the thriller lovers. Planning a vacation? Take this book along with you. It could be a very good travel companion especially if you are planning for a train journey! I would give 4/5 stars for this book. This book would transport you to a completely different world, a world where mystery overpowers everything. To know more about the book you should definitely read Exit Point. Anil Goel is a Mumbai raised, IT personal who wrote 2.0 the first IT thriller of India. To him the computer is the panacea for all challenges and he uses it as the fabric to tailor his tales. He has earned the moniker of Prophet Of Doom by Deccan Herald and can be reached at http://www.facebook.com/anilgoel.